Each month starting November 2017, I'll be speaking to authors about their new books in South Asian Studies, very broadly defined, on the New Books Network podcast. With over 70 "channels" dedicated to area studies, history, art, fiction, popular culture and critical theory, the NBN is a consortium of podcasts devoted to introducing authors to new and old audiences, in and outside academia. My last interview of 2018, I spoke to anthropologist Alf Gunvald Nilsen about the Indian state’s everyday tyranny against its Bhil citizens. 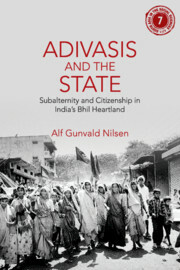 Nilsen’s new book Adivasis and the State: Subalternity and Citizenship in India’s Bhil Heartland parse how the deep tentacles of caste and class power embodied as the state reach into the adivasil everyday, not tethered to single issues of “development” induced displacement or the disappearing commons, but as an all-encompassing structural violence manifested in the realities of malnutrition, agricultural debt and seasonal migration. LISTEN HERE. What do India's youth really want?